Straight after Christmas and New Year celebrations, Unify came screaming around the corner to punch you in the face. It was brutal, but like all mosh injuries it was something to show off and brag about. For those who have never made the trip to Tarwin Lower in Gippsland, Unify Gathering is a sanctuary for lovers of anything heavy, held for just one weekend a year. When you’ve got camping and BYO naughty waters, the vibe is already loose but it’s the kind of place where you make friends anywhere, from the neighbouring tent to the mosh pit. The lineup was straight up blazing. Day one featured headliners Parkway Drive, Architects, Tonight Alive and Four Year Strong. Then Saturday boasted The Amity Affliction, Hands Like Houses, Hellions and Stick To Your Guns. There were some fresh bands to kick off each day: Save The Clocktower, Dear Seattle, Mirrors and Sienna Skies, and they definitely rose to the occasion. There were some major highlights and—despite the legends who played Uno in the middle of the mosh—Tonight Alive were a must see. Vocalist Jenna McDougall was so comfortable on stage moving with the music with a predatory stalk and belting out tunes from her band’s recently released album Underworld. ‘Temple,’ ‘The Edge’ and ‘Lonely Girl’ were powerful and let me tell you, that band gained new fans that night. 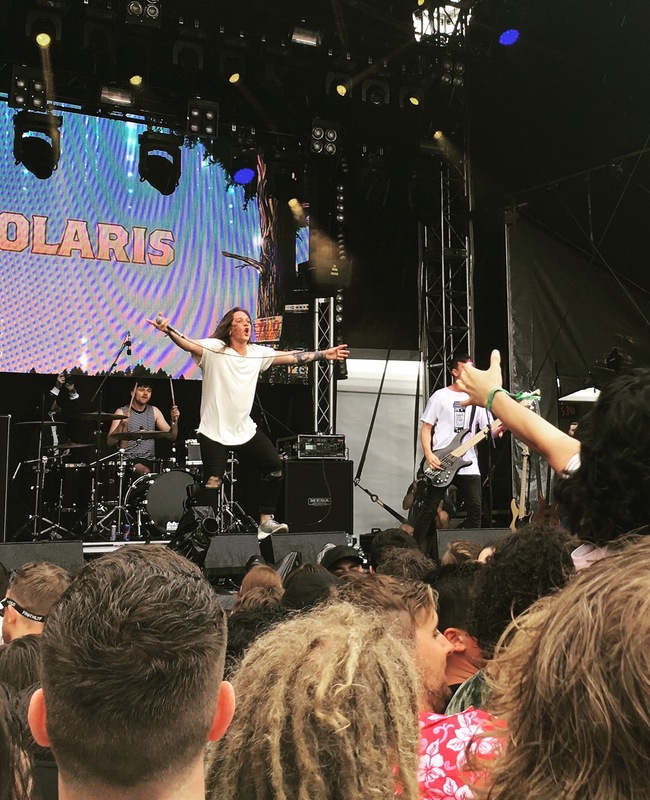 It was Polaris’ second year at Unify and their growth since last year has been huge. A debut album, international tours and a massive rise in confidence and experience meant that their set was a shock to the core. Guitarist Rick Schneider had a quick chat to TEO about 2017 vs 2018, noting this year when they played their opening song, ‘Lucid,’ the crowd was bigger than their closing song at Unify 2017! With bangers like ‘The Remedy,’ ‘Consume’ and ‘The Slow Decay’ it’s no wonder. The only way for these fellas is up. Architects had played in Adelaide on the Thursday before Unify and there were quite a number of people who saw them play at The Gov before driving to Unify to watch them again. The quality of their live show is unparalleled, brutal force with driving melodies that reach out and ensnare crowds. Their guitarist, Tom Searle, passed away from cancer not too long ago and when the band played ‘Doomsday,’ a song he co-wrote with brother and drummer Dan Searle, the crowd dropped to their knees. Emotions ran high on stage and off, and the band reached out to say, “…there is no shame in crying. There is no shame in hurting. And there is no shame in telling your loved ones that you love them, ’cause you don’t know how long you have left.” It was a heartfelt set and words aren’t enough. Parkway Drive stormed the stage after and their crowd involvement went next level. ‘Dead Man’s Chest’ was intense, as was ‘Carrion,’ but the real show stopper was the last song, ‘Bottom Feeder.’ Vocalist Winston McCall shouted for a wall of death all the way back to the sound desk, and the crowd complied. He jumped the barrier, separating the crowd as he ran to stand on the sound desk barrier, and when that last breakdown hit, bodies collided. And Winston crowd surfed the entire way back to the stage. You don’t see this kind of thing very often, and not many bands can command that kind of respect. There are too many memorable moments about this festival: the almost constant rain; the questionable KarTents; paying with Unicoin, a dangerously easy chip on your wristband; the crowd forming a line and rowing on the ground; the Power Ranger in the pit; Young Lions’ impressive crowd surfing; the shoeys that were drunk; and let’s not forget Hellion’s triumphant return after last year’s absence. 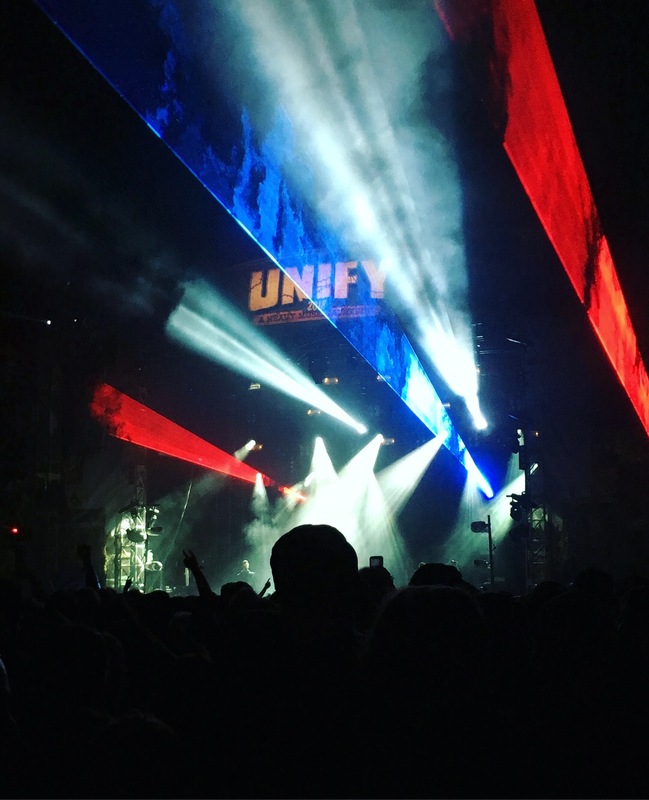 We said it last year, and we’ll say it again: Unify is the kind of festival you buy tickets to regardless of the lineup because the organisation, the atmosphere and the people who stand in the crowd, rain or shine, are what make this festival great.